I was going to post about something completely different today — a book that I have been asked to review — when I was reminded in a most unpleasant way of one of the key tenets in my philosophy of applied elegance. The elegant person is unhurried. Or at least so he appears to be. In this era of multitasking, connectivity and more information delivered at the touch of a key than the average person at the founding of our country would have amassed in a lifetime, it pays to remain calm, collected, cool-headed, unruffled. Slow and steady will win the race. I admit to having difficulty controlling my enthusiasm. A particularly stirring crescendo, a dramatic denouement, or simply the many demands of modern life sometimes knock me off my pins. With my serenity disturbed, little annoyances begin to take their toll and I wind up spinning in circles, overreacting like Rabbit in an A.A. Milne story. In the four hour window of time that I have to myself today I have listed the following tasks to be accomplished: 1) Work out; 2) Post; 3) Laundry; 4) Read; 5) Sort through some photos; 6) Begin book review; 7) Housecleaning. Tasks 1, 2 and 3 are complete or underway. I shaved a mile off my run, am posting now and popped load one in to the laundry. 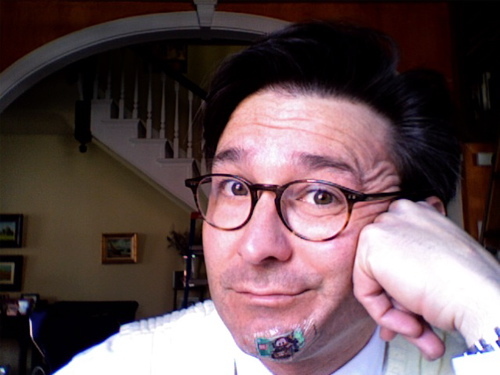 I also rushed through my morning shave while listening to Performance Today on NPR. Distracted as I was making my mental lists and wondering what I was going to say about the book, I also shaved a bit off my chin. Well, enough that the liquid bandage wouldn’t take since I was bleeding profusely. In fact, the only bandage that would stick and seal off the cut was one of my son’s waterproof ones. So expect to see me sporting an Italian three day beard in the near future. And moving in more measured manner. Not that I will dally too long. But I will try to remain unrushed this year. I will pace myself. I will not hurry. Not by the hair of my chinny-chin-chin. 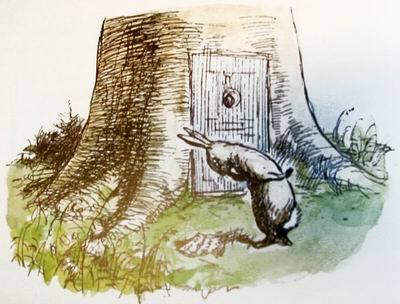 This entry was posted in Elegantology and tagged "Cars", A.A. Milne, E.H. Shepard, Performance Today, Rabbit. Bookmark the permalink. I am puzzled why you don’t obtain more time for yourself by employing a cleaning woman. In these recessionary times more labour is available for such work. Also, it doesn’t seem terribly elegant doing the laundry and cleaning the house yourself. little blips and nicks are the best sort of reminders, and “oh bothers” to our day. Hello All, the bandage is gone, what a relief. Thanks. The children got a good chuckle out of it. Hello Mr. Ismore, yours is a fine idea. I do employ a cleaning woman, but only on a bi-weekly basis as I try and live within my means and continue my studies of elegance. The house is about 4,000 sq. feet and can get expensive to detail; the drycleaner gets a lot of business, but the kids manage to generate a lot more laundry. Not having a serious income does hamper one’s efforts… all contributions to the Easy and Elegant Life Whisky and Suiting Relief are gratefully accepted. You made my day! Some days the blog seems like a full time job, so I am considering that I now have permission to slow down. It’s supposed to be something we do because we want to and it’s fun, right?